Feb. 22, 2017, 11:49 a.m.
By Joseph Lichterman @ylichterman Feb. 22, 2017, 11:49 a.m.
Last summer, two weeks after the United Kingdom voted to leave the European Union, the British regional publisher Archant launched a new weekly newspaper, The New European, aimed at the 48 percent of British voters who didn’t support Brexit. 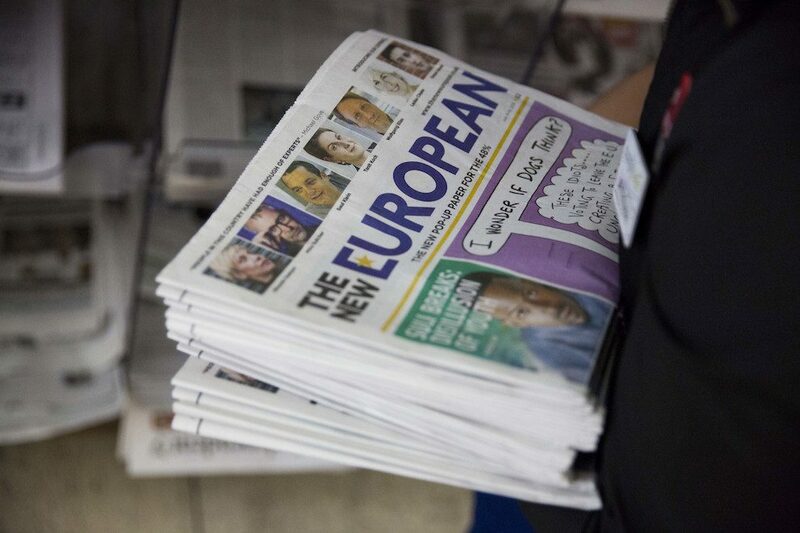 The New European was supposed to be a “pop-up” newspaper, with a planned run of just four weeks. But the publication has developed enough of a following that Archant has decided to continue publishing through at least the end of the year, editor Matt Kelly, who is also Archant’s chief content officer, told me. And while The New European started out as a print-only publication, it’s since added a digital presence that is pulling in more than a million pageviews a month. The paper, which sells on newsstands for £2 a copy and as a subscription at £20 for 13 weeks, has a circulation of 20,000 and a staff of five — two editors, two designers, and Kelly. Just about all of its writing comes from outside contributors; former Prime Minister Tony Blair wrote a piece for the paper last fall. Archant is now considering launching other pop-up publications, which it’s positioned to do thanks to its existing access to a distribution system. “We couldn’t have done it if we weren’t already quite a big newspaper publisher,” Kelly said. Kelly and I discussed what’s next for The New European, the mechanics of producing a pop-up publication, and whether he thinks a similar newspaper could work in the United States. Here’s a lightly edited and condensed transcript of our conversation. Joseph Lichterman: The paper was started as a pop-up and was only supposed to last a few weeks. But you’re still going. Can you tell me a bit about how things have gone and why have you decided to continue publishing? Matt Kelly: Well, people seem to like us. They still buy us, so we’re still publishing. That was very much the expectation when we launched The New European: There would be several weeks of acute interest in this topic, and then it would wane and life would move on. That hasn’t happened. In fact, if anything, the interest has grown. We’ve never had a week where we didn’t have something fabulous to write about. That’s why we’re still publishing — it’s still interesting. People are still buying us, and we’re still a strong, relevant voice in a media landscape in the U.K. that doesn’t have a lot pro–European Union voices. People have latched onto The New European with an unusual intensity. Obviously, people feel very strongly about this issue, and because we launched as a single-issue newspaper, we very quickly became seen as the voice for that community. Readers are very passionate about the product. They take photographs of themselves reading it and post them on Twitter. They leave copies once they’re finished with them in doctors’ waiting rooms and bus stops for other people to read. Writers are very keen to engage with the project for a couple of reasons. One is that it’s a newspaper and the truth is that a lot of journalists and writers feel that there’s something special about print. Secondly, it’s a visible articulation of their values. If you’re associating yourself with The New European, you’re making it very clear that you’re pro-European and there’s no ambiguity about that position. Lichterman: What went into your decision to start with print, and how has your thinking about The New European’s digital strategy evolved? Kelly: It was strange to launch a new newspaper, especially in the U.K. where already that year there had been two notable business failures of new national newspaper launches. It was assumed that print is dead, and it’s incredibly counterintuitive now to focus on print in the digital world, but we thought there were some very compelling reasons to go print-first. If I had decided to launch a website, I never could have attracted the caliber of writers we have attracted for the new newspaper. The industry was interested in it; it generated a lot of buzz. The second thing, of course, is the propensity to pay. Basically, our only real revenue is subscription price. If we had launched a new website with a paywall, again, who would’ve looked at it? Who would’ve been interested? The third element, which is interesting when we talk about the concept of pop-up publishing, is that it’s a visible demonstration of your interest. You can’t visibly demonstrate a website. You can’t carry a laptop around and show people what you’re reading, what you’re interested in. But a newspaper is a very visible demonstration of your beliefs, your passion, and what you’re interested in. We established the brand in print, but digital has become more and more important to us in order to market it. We now have a decent website where we put up content from last week’s issue and a couple of pieces from this week’s issue and we try to generate a conversation and lots of media sharing on social. It’s working very well. The site launched just two months ago, and it’s already doing a million pageviews a month. Lichterman: You mentioned that the business is built on subscriptions. Is there advertising as well? What’s the breakdown? Kelly: There is a little bit of advertising. Not as much as I’d like. But one of the problems we had — and this is one of the flaws with the pop-up publishing model — is that advertisers want to know if you’re going to stick around. The whole shtick to begin with was that we would be ending the experience, so it was hard to engage advertisers. But now we’re sticking around and we’re seeing more interest from advertisers, particularly from advertisers who are interested in the issue of Brexit. People who are organizing marches against Brexit are also advertising in The New European. Lichterman: Since you launched, a whole lot has happened globally, not least the election of Donald Trump. Do you think the larger global trend toward nationalism has increased your longevity? Kelly: Yes, definitely. In fact, we have expanded our coverage to cover issues like Donald Trump. Of course, all of these things are highly interrelated. This week’s cover is an attack on Donald Trump, and we’ve now run, I think, five covers on Donald Trump and U.S. politics. We’ve also talked about the far right in Europe generally, and the crisis in Aleppo; we had a very striking front page about the bombing of Aleppo. I think society is more interested in political issues now than it was last year, and we’ve benefited from that. Lichterman: Do you think that something like an anti-Trump pop-up publication could work here? Kelly: The U.S. is a very different market, so I don’t want to be presumptuous. However, why isn’t anybody doing a weekly Trump Watch newspaper? I think that would be a good thing to do. We could take a lot of lessons from the way the Leave campaign in the U.K. and Donald Trump’s campaign were run. The media has become much more polarized. If I were a U.S. journalist, I would be looking to launch The Trump Watch. Lichterman: Are there other topics where a pop-up publication might work? Kelly: Definitely. I’m a big David Bowie fan, and when David Bowie died, it would have been the perfect opportunity to do something, for a couple of weeks that was really in-depth about all the news and the reaction about Bowie’s death, much more so than the national media did. The national media come in and they do it brilliantly on Day 1, they do it great on Day 2, and then 10 days later someone launches a magazine that is a souvenir of Bowie’s life. In the middle of that, there is a market, I think, for a publication that satisfies the immediate zeitgeist of interest in whatever the topic may be. There are lots of different applications for this. The trick is not to spend a lot of money on marketing, advertising, dummies, or staff. The trick is to be able to throw out these products very quickly within your existing organization and to be very clear about when you’re going to kill them before you start. You don’t want to limp on when, really, you should kill it quickly. We’re very bad, as an industry, at killing things that are failing. Equally, in the case of The New European, if it carries on succeeding, the pop-up can pop-up much longer than anticipated. Lichterman: Do you have plans for when you’re going to stop publishing The New European? Kelly: If circulation falls to a certain level, it would be a big indicator to start to think about killing it. But it’s nowhere near that at the moment. We have a business plan for all of this year. My hope is that we continue to grow, advertising revenues begin to come in at a greater extent than they are now, and The New European becomes a fixture. That would be great. Lichterman: What is that point that you would need to hit for circulation? Kelly: I couldn’t tell you. Lichterman: Does Archant have plans for more pop-ups? Kelly We’ve been thinking about pop-up publications around other verticals that we think are interesting and underserved. Perhaps around technology, gadgets, around particular interests. It even crossed our minds to do a pop-up newspaper for people who want to leave Europe — the complete opposite of The New European. None of this is new. If we were a digital startup, nobody would blink, but because we’re a newspaper company, it’s seen to be a great departure. There’s a lot that old legacy business can learn from how entrepreneurs think and act. Photo of The New European by AP/Matt Dunham. POSTED Feb. 22, 2017, 11:49 a.m.
Lichterman, Joseph. "This anti-Brexit newspaper first launched as a pop-up, but it’s doing well enough to continue indefinitely." Nieman Journalism Lab. Nieman Foundation for Journalism at Harvard, 22 Feb. 2017. Web. 20 Apr. 2019. Lichterman, Joseph. "This anti-Brexit newspaper first launched as a pop-up, but it’s doing well enough to continue indefinitely." Nieman Journalism Lab. Last modified February 22, 2017. Accessed April 20, 2019. https://www.niemanlab.org/2017/02/this-anti-brexit-newspaper-first-launched-as-a-pop-up-but-its-doing-well-enough-to-continue-indefinitely/.